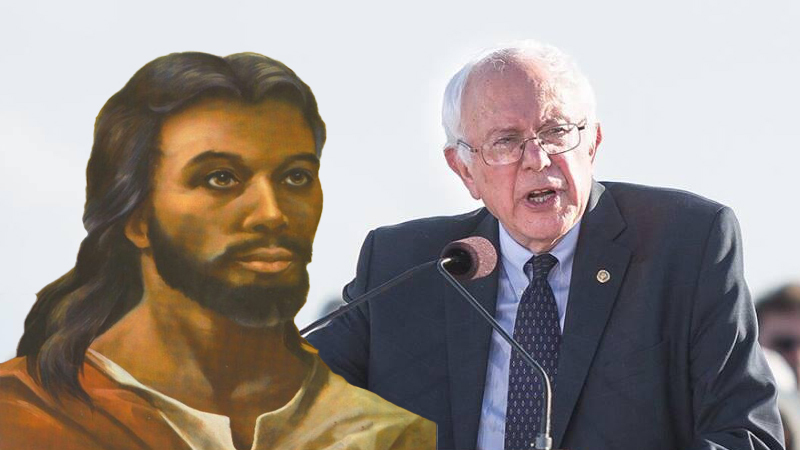 I hear quite a few people saying Bernie Sanders sounds like Jesus, even among Evangelicals. Here's the truth; Bernie Sanders is Caesar, not Jesus. What do I mean? Sanders wants to radically expand government. This he will allegedly do in order to help the poor and the middle class. His new budget proposal would add 18 trillion dollars of new spending over the next decade. That would be the cost for his many new programs, according to basic economic estimates. This doesn't include the old spending, either, only the new. How would he pay for it all? According to Sanders he'd tax the rich at 90% and substantially cut the military budget. There's just a few problems with his proposal. First, the military is about 18% of overall governmental costs. If you take all entitlements, including Medicare, Medicaid and Social Security, including interest on our debt, which is about 6%, they total 71% of the Federal government's expenses. So, he doesn't begin to have the means necessary to pay for it all by cutting the military. Second, once people enter a higher tax bracket, they either stop producing wealth or they shelter their money. If you take away the tax shelters, you get less investment. Why? Many tax shelters involve investment in stocks or bonds, which give businesses the much needed working capital to grow and expand. Real Estate is another way of sheltering your money from Uncle Sam. Who thinks it would be reasonable to undermine the engine of a good portion of America's wealth, to say nothing of its housing stock. Simply put, the higher the tax rate, the less productive people become, which impoverishes all Americans. This isn't rocket science people. It's human nature. And, wherever such policies are enacted, this is the inevitable result. Finally, with less wealth there is simply no way to pay for what we currently have, let alone 18 trillion in new spending. It will only lead to higher unemployment, lower tax revenues (by a sizable margin) increased debt—and, inevitably, inflation, making everything more expensive. This is a circular problem. Not surprisingly, born of circular reasoning. Sanders economic and political ideas do empower one group, though, that being government. Once you get past the lofty rhetoric, Bernie Sanders is just one more politician promising what he can't hope to deliver. But people are gullible. Worse still, they are willfully ignorant. That's why Bernie Sanders is really Caesar and not Jesus.